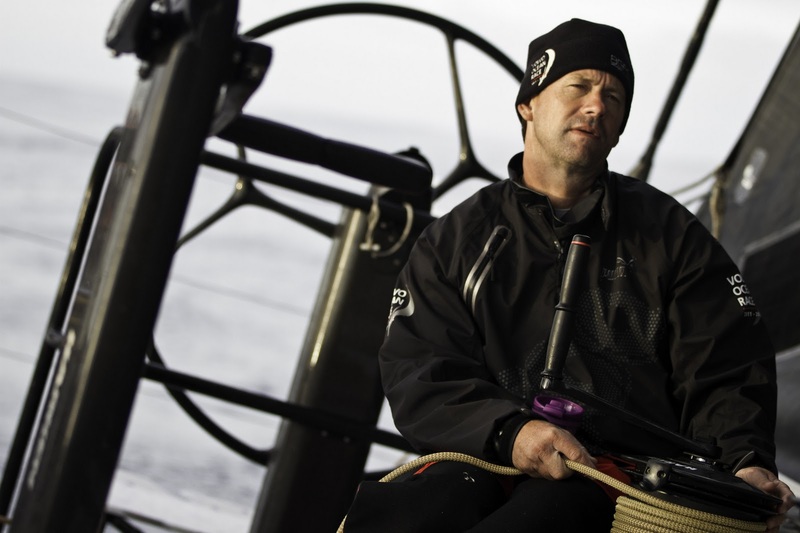 As night falls on the Volvo Ocean Race fleet, the notorious Agulhas current will come into play. Thirty-knot winds will whip six-metre waves into a hurling mass, caused by the wind blowing against the direction of the current. And it’s much more difficult when it’s dark. The crews will not have time to acclimatise to the sea state during daylight hours. The boats will be on a fast reach, leaping off waves that the helmsmen can barely see, helped only by the light of a big moon and clear skies. It will be essential to play the waves, but these could be boat-breaking conditions. Ken Read will be very aware of what can happen. It was on this leg in the 2008-09 race, which took the fleet from Cape Town to Cochin in India that PUMA’s Il Mostro launched off a wave and landed with a sickening thud, damaging the main longitudinal frame. Ian Walker also ran into trouble on this leg previously when his boat, Green Dragon broke her steering gear and crashed into a horrendous Chinese gybe and, later, when a 50-knot gust ripped through the fleet, her boom snapped. All this to look forward to tonight, meanwhile the past 12 hours or so have been very complicated. 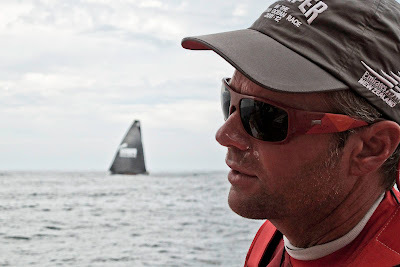 The fleet has continued to be in sight of each other, as they tacked down the coast of South Africa, something very unusual and unexpected in this race. Coastal navigation requires constant input from the navigators, who have had very little sleep so far, just catnapping between taking bearings and assessing their boat’s performance against those closest to them. 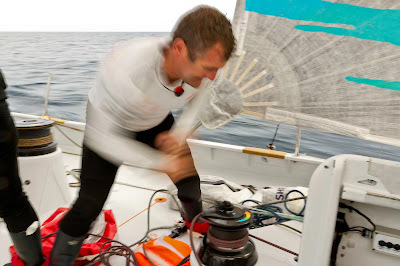 However, according to Will Oxley, navigator of CAMPER (Chris Nicholson/AUS), who was in the lead earlier today, it is much less stressful when you know where the opposition is, and a lot more fun as the crew of Groupama 4 (Franck Cammas/FRA) has discovered after their lonely race during leg one. 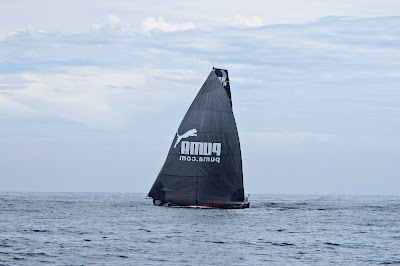 At 1600 UTC this afternoon, Groupama 4 became the new leader from Team Sanya (Mike Sanderson/NZL) and PUMA’s Mar Mostro and held onto her lead at 1900 UTC tonight. 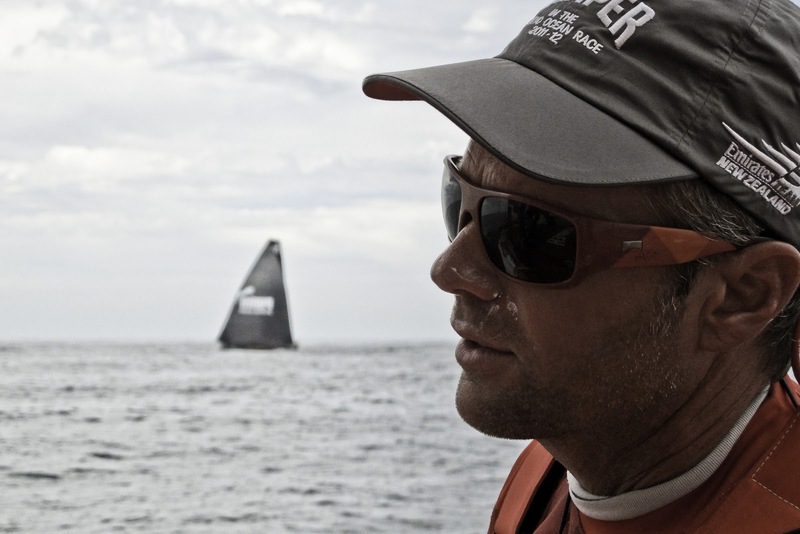 CAMPER moved back up to second place, relegating PUMA’s Mar Mostro to third. 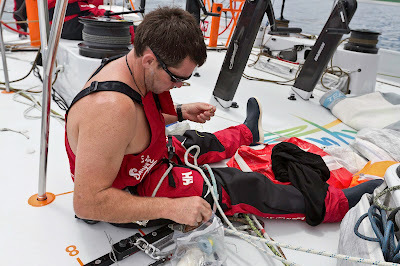 Team Sanya is now the back marker, having lost 28 nm by being becalmed in torrential rain.